WASHINGTON - The Lawyers' Committee for Civil Rights Under Law remains concerned about low-income and minority communities impacted by Hurricane Katrina six years ago and presently. "We are still committed to fighting for racial justice and ongoing recovery efforts in the Gulf," said Lawyers' Committee Executive Director Barbara Arnwine. "There is still much work to be done and it is quite disheartening that these vulnerable and disadvantaged groups continue to be victimized by collateral consequences of the nation's most devastating hurricane in history." In 2010, on the occasion of the National Bar Association's 85th Annual Convention in New Orleans, Louisiana, the Lawyers' Committee released "Five Years of Commitment: Providing Legal Assistance in the Gulf Post Katrina." 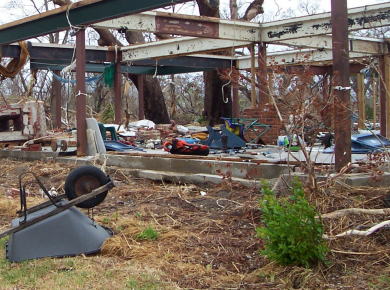 The report details the organization's commitment to low-income and minority communities disproportionately affected in both Louisiana and Mississippi following the wrath of Hurricane Katrina. In addition to addressing issues of adequate housing, ongoing efforts detailed in the report, include collaborative title clearing for homeowners affordable housing development, community land trusts, and environmental justice. Also, issues such as employment opportunities and access to quality healthcare and education remain, and have been exacerbated by new disasters including Hurricanes Gustav and Ike and the BP oil disaster, as other national community leaders have stated. Within two weeks of the hurricane slamming ashore on August 29, 2005, a Lawyers' Committee staff attorney was on-site in the Gulf Coast assisting clients. "Within a month we partnered with our Mississippi affiliate, the Mississippi Center for Justice (MCJ), and formed the Disaster Survivors Legal Assistance Initiative and quickly forged a strong partnership with the Greater New Orleans Fair Housing Action Center," added Ms. Arnwine. Through the Initiative, the Lawyers' Committee has emerged as the leading national civil rights organization providing legal assistance to victims of Hurricanes Katrina and Rita. Between 2005 and 2009, law firms contributed 34,856 pro bono hours valued at $16,121,000. Within two months of the storm, the Lawyers' Committee brought the first challenge to the failed response of FEMA in the landmark McWaters v. FEMA case, forcing FEMA to improve and continue providing housing assistance to tens of thousands of Hurricane Katrina victims. Since 2005, the Lawyers' Committee, MCJ, key board members serving on a Gulf Coast Task Force and scores of legal volunteers have supported a wide array of housing and community economic development initiatives and engaged aggressively in fair housing advocacy and litigation. The needs in the region are still great. In assessing continuing needs, Lawyers' Committee staff have met with over 40 community organizations in Louisiana and Mississippi, many of which we have worked with since the Initiative was launched. Significant barriers to affordable and fair housing opportunities continue to exist, requiring both transactional and litigation assistance. In fact, local groups have specifically identified an unmet need for legal assistance for community organizations engaged in affordable housing development and advocacy. We join activists across the Gulf and nationwide in calling upon Congress and the Administration to support the RESTORE the Gulf Coast Act of 2011. "While the Lawyers' Committee agrees that this legislation introduced in the Senate in July requiring 80 percent of Clean Water Act penalties levied against BP for the drilling disaster to go towards ecological and economic restoration of the Gulf is a good start, it is not enough," said Lawyers' Committee Public Policy Director Tanya Clay House. "Legislation which fully addresses massive disparities and inequalities is long overdue."